Texture and Enamel: Basse Taille Two Ways | Metalwerx, Inc. This two-day weekend workshop will cover techniques to create textures on metal surface to enhance the appearance of transparent enamels. Whether it is used to increase light reflection or add another layer to your designs, this process offers exciting possibilities to add to the complexity of your enamel pieces. We will cover metal etching, application of roller printed textures and templates and the use of chasing and engraving tools. This is a hands-on workshop where technical demonstrations will alternate with time to practice and apply your new skills. Barbara Seidenath was born and raised in Munich, Germany. She studied Jewelry making at the State School for Glass and Jewelry in Neugablonz, Germany where she received a Bachelor of Fine Arts degree in Goldsmithing, followed by a Masters of Fine Arts degree from the Academy of Fine Arts, Munich. 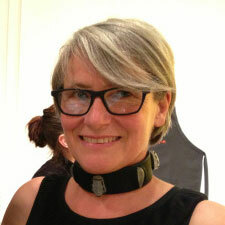 Seidenath has been on the teaching faculty of the Rhode Island School of Design, Providence, RI for nearly two decades. She also teaches at the School of the Museum of Fine Arts in Boston and has been a faculty member at Massachusetts College of Art and Design. She has taught many seminars and workshops in the U.S. and abroad and has had her work shown in international solo and group exhibitions. There is a $20 material fee for this workshop that is payable upon registration. It includes 20g and 22g copper sheet as well as a dust mask and the use of studio enamels.